Adjustment technology in action on a Warman slurry pump. In response to a recognition that the throatbush wear rate has a major impact in the overall efficiency of slurry pumps, Weir Minerals has developed rotating and axial adjustment technology. Adjusting the gap between the throatbush and the impeller front shroud reduces hydraulic recirculation in the pump. This prevents localised wear on the throatbush and improves hydraulic efficiency. The adjustments are often done during pump operation, but this can have safety implications for staff. 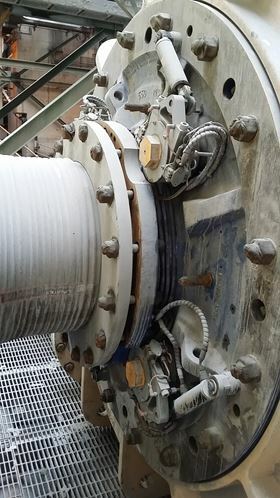 Marcus Lane, global product manager for centrifugal pumps at Weir Minerals, said that manually adjustment is very labour intensive and the company wanted to find a safer and quicker way to extend the wear life of the pump with regular adjustments and this has led to development of this technology. Weir’s automated throatbush adjustment solutions are available for pumps fitted with either rubber or alloy throatbushes on Warman slurry pumps used in the most arduous applications. The systems speed up the process, allowing for more frequent adjustments with minimal effort. When maintaining an alloy throatbush, all four bolts are adjusted at the same time to ensure even adjustment and accurate positioning.